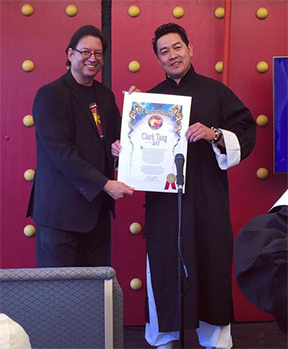 Burbank, CA – This week the Martial Arts History Museum was proud to honor Wing Chun advocate and chief instructor Sifu Clark Tang. A descendent of the lineage of Ip Man, students, friends and peers came together to celebrate his life's work in promoting the traditions and benefits of the Chinese Kung Fu art of Wing Chun. Wing Chun, one of the only known styles of Kung Fu that was created by a female, was brought to light by one of its most popular practitioners, film and tv star Bruce Lee. Lee was a student of Ip Man prior to coming to America and embarking on a career as Kato in The Green Hornet and starring in films such as Enter the Dragon, Way of the Dragon, Chinese Connection and Fists of Fury. The Kung Fu art of Wing Chun is one of many unique and powerful forms embedded in Chinese culture. Although for many years it did not receive the notoriety of the Shaolin Kung Fu styles, it was Bruce Lee's films that thrust Wing Chun into American society. “Clark Tang, a student of Sifu Wong Long Ching, who was a senior student of Ip Man and classmate of Bruce Lee, has brought new life to Wing Chun and has played a major role in spreading the art along the West Coast,” notes museum president Michael Matsuda. Tang, a recipient of the Martial Arts History Museum Honor Awards in 2014, was acknowledged at the event by a variety of martial arts icons and pioneers. “This day is not about me, it's about all of us, this is our day,” notes recipient Tang. “I am humbled.” Tang is owner and instructor of the Wing Chun Temple Kung Fu school in Long Beach, CA. The Martial Arts History Museum is located at 2319 W. Magnolia Blvd., Burbank, CA 91506. Website is www.Mamuseum.com and can be reached at info@mamuseum.com. The museum is a Non-Profit 501(c)(3) organization.